Aight Action-users and Mirillis team, i think it's better we have an actual topic for our wishlist in this section for everyone to see. Mirillis has already said numerous times that there's a load of features included in their to-do list, but we never actually see the suggestions again after a while because they drown into the older section pages and not everyone has the patience/time to dig them up again, not to mention they become hard to see and newer users don't even know they exist. So, let's save up time and effort, and best of all, keep track of our requests and bring the suggestions to this topic! These first suggestions come from me and from topics i saw. EDIT: Apperantly i should've been more specific with this topic. When i said Wishlist, i meant our POV's towards Action itself, not what Mirillis is doing! Oh, and can this topic be stickied? Last edited by Claunator on Mon Dec 08, 2014 7:43 pm, edited 9 times in total. 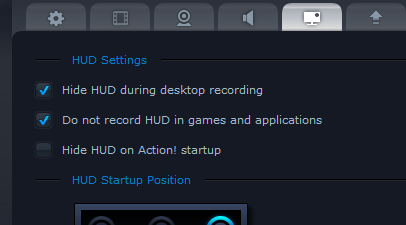 * Downgrade option (the two latest updates has been a pain for me since Action sometimes won't work on some games, and because I'm unabled to record in 60 FPS using the AMD App without having a buggy 40 seconds playback). * FPS counter displays actual game FPS rather than video FPS. I already know what FPS I record in. * Choose if you want to use CPU or GPU. * Oculus Rift "translator" (by that I mean turning the dual fish-eye screen into a normal 16:9 screen). * Devblog for further patches (sneak peak of what they are doing, could also be good for the community to add suggestions). I guess i should've said desktop recording then. [img]Edit:[/img] It appears that it now completely gets rid of the HUD rather than just on the playback... I guess the latest update did that, because I did not have that issue when I recorded in Desktop when Mantle came out for BF4. Thank you for all the suggestions. I will keep this thread monitored if something that's not on the current wishlist is added. Audio limiter(like in audio editors) for microphone audio signal, in order to avoid audio clipping, when the signal is too loud (user yells or speaks too loudly). It will be much better than to correct errors in audio editors, because with the limiter on, there will be no audio cliping. It's much better than every time to adjust the microphone volume level for different needs - for quiet or loud talking, and etc. ..
Something like "Dynamic microphone volume level", with fast response/attack(the response/attack should not be too large, otherwise it will be low efficiency), when the level is approaching a certain high value dB(for example, 0 dB and higher), then microphone level is reducing, when the level is too small, it increases to a certain level. As a result, we should get rid of the sound clipping from microphone and manual adjustment of the input level(when talking quiet or loud). And even better, if the function is to maintain a certain stable microphone volume level, increasing(quiet talking) or decreasing(loud talking) wherever it is required. Or if achievable and this and that, then DMVL + Limiter, because limiter that protects from the microphone volume clipping, DMVL should work with low signal level only, ie only increase when the level is low. Though I personally do not know whether it is realizable. But in some audio editors, these functions(while recording with the microphone) are present. Last edited by Buffometer on Thu Oct 23, 2014 6:31 pm, edited 2 times in total. This would be fantastic and would save me hundreds of gigs of storage space when I'm recording videos for games. I know mirillis has toyed with this option and didn't get good results, but even if they introduce it with a simple 1-5 minute buffer it would fantastic. Have an option to start recording immediately after the "duration" counter is up. If I let my video run too long, they crash and I lose everything. As it is, I run my videos for 20 minutes and I have a timer beside my computer that goes off every 20 minutes to remind me to start recording again. Having the app auto-start the recording everytime would remove me having to keep track of all this. I understand that there will always be issues with an app because of the multitude of hardware/software configs out there so give us an option to deal with these types of bugs (until they are resolved or at least to make our lives easier if they are not resolved). Other than that, this recording tool is fantastic and I want to say that I love this piece of software. I alrdy mentioned this but it's no surprise to hear it multiple times. 1) Ability to trim from beginning and end of video after a recording is made. 2) A more user-friendly folder navigation. It seems to take a lot of steps to find the folder that you want to store the recording in. For instance, the user's "Desktop" folder is not easily available. You have to navigate to c:\users, then c:\users\xxxxx, and finally c:\users\xxxxx\desktop. 3) In addition to game/desktop screen/area selection for recording, it would be nice to have a way to record an area (800x600, etc.) around where the cursor as it moves. Sort of a "dynamic" recording area. 4) The "snap to windows" option on the area selection is a great feature, but has issues such as it's toolbar not available when selecting very small areas. Maybe a different toolbar option on the area selection would help. Also, the "snapping" of a area seems not to work very well with contents of certain windows. Add option to use additional lossless codecs(they must be installed in the system). They are both very high-performance lossless codecs for FHD and higher resolution. Last edited by Buffometer on Tue Nov 11, 2014 11:43 am, edited 2 times in total.